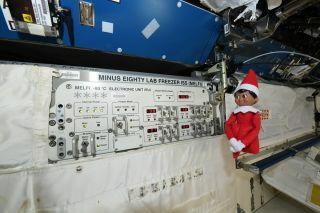 This tweeted picture from NASA astronaut Anne McClain shows an "elf" on top of the MELFI, a freezer on the International Space Station, in December 2018. While NASA astronaut Anne McClain can't take her son to space with her, she's spreading Christmas cheer for all kids watching her cosmic Elf on the Shelf campaign. An "elf" gets a little tangled up with spacesuit hardware on the International Space Station on December 2018. For those parents not in the know, Elf on the Shelf is a toy series based in part on a 2005 book written by Carol Aebersold and her daughter Chanda Bell and illustrated by Coë Steinwart. The premise is that Santa Claus knows if children are naughty or nice because he has a fleet of helper elves who hide in people's houses, watching the families' activities. Stealth elf: This picture from NASA astronaut Anne McClain shows the hiding spot for one of Santa's helpers on the International Space Station. "Ohhhh, I see what you did here. … ELF ON THE MELFI!" McClain said (or maybe she shouted?) in another tweet from space. "And yes, buddy, those are cold temperatures — colder than the North Pole. They preserve our science samples until we can get them back to scientists on the ground. #ElfInSpace"
This delivery isn't Santa's, but it probably felt like it. A SpaceX Dragon spacecraft (background) is berthed with the International Space Station in this picture taken Dec. 8. In the foreground is a dragon stuffed animal from NASA astronaut Anne McClain's young son. While it's unclear where the elf is hiding now, McClain did report on another important matter on the station: where her son's dragon stuffed animal was stored. The elf actually gave the dragon a hug during launch, as shown in pictures broadcast from McClain's Soyuz spacecraft as Expedition 58 went into orbit on Dec. 3. But another picture taken just days later shows the dragon is also roaming about. "The number of Dragons on @Space_Station just doubled!" McClain tweeted on Dec. 8, sharing a picture from the space station's Cupola window. In front of the windowpane was her son's dragon toy, while behind the windowpane floated the Dragon spacecraft from SpaceX, carrying a load of precious cargo to the station. "Congratulations to @SpaceX on a successful launch and to all the teams across the world who enable such amazing feats," she added. A Christmas elf embraces a dragon stuffed toy (top of picture) during the launch of Expedition 58 on Dec. 3, 2018. The dragon belongs to the son of NASA astronaut Anne McClain, who is pictured just below the floating toys. This picture is a screenshot of a launch video. Let's hope that cargo delivery included Christmas candy for the hardworking Expedition 58 crew, which will assume solo duties of the space station after Expedition 57 departs on Dec. 20. Flying along with McClain are Canadian astronaut David Saint-Jacques and Russian cosmonaut Oleg Kononenko.